New Delhi : A couple of days before Prime Minister is to launch Magenta line of Delhi Metro, its driverless trial run failed with wall crash at Sarita Vihar depot on Tuesday. No one was injured. A trial of driverless Delhi Metro on Magenta line failed after it did not stop at the desired spot and banged with the wall ahead at the Kalindi Kunj Metro Depot around 3:40 pm. The Delhi Metro department cited brake failure as the reason behind the incident.A investigation on the matter has also been initiated. 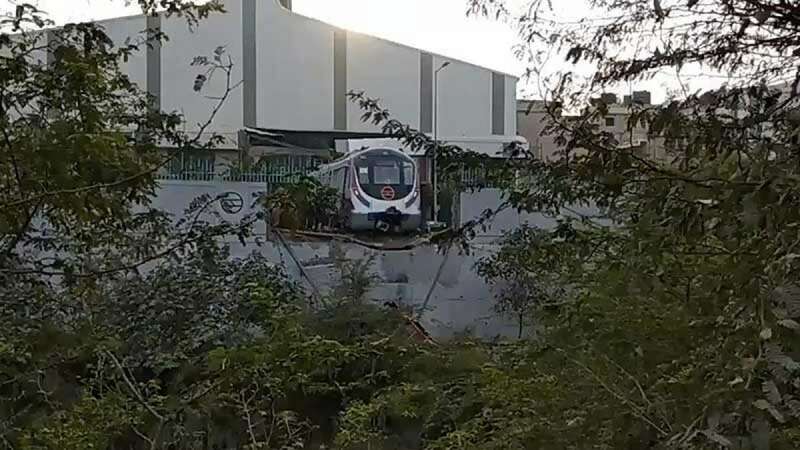 "A trial train was moved from the workshop without testing the brake system as a result of which, while the train was moving up the ramp for washing, it rolled back and hit the adjacent boundary wall," said the Delhi Metro Rail Corporation (DMRC) statement. They also called it a human error. The DMRC said it appeared to have occurred because the brakes were not checked properly after the train was taken off the signalling system by the person who was in charge of the train. "Prima facie, it appears, this was not done and subsequently, the person who took charge of the train from the maintenance staff also did not check the brake and proceeded with the train up to the washing plant built on a ramp. While stopping at the ramp, since the brakes were not available, the train rolled back causing this incident," it said. The Magenta Line of Delhi Metro from Botanical Garden to Kalkaji Mandir will be inaugurated by Prime Minister Narendra Modi on December 25.